There are simply countless Indian Voodoo Spells of a diverse nature, which are practiced all the time by Black magic Spell Casters to harass an enemy and make his life miserable. This Yantra, which, I have written about in this post is one such paranormal occult spell, which in the literal sense of the word gives headaches to an enemy by making his head pain. In the Hindi language, this Yantra is called the Dushman Ko Sar Dard Dene Ka Yantra. The Yantra shown in the image has to be drawn using any kind of ink or pen on a leaf of a Kaner Tree, commonly called as the Oleander Tree in the English language. Once prepared, the Yantra should be kept on the ground and the Spell Caster should take the name of the enemy, whom he wishes to give a Headache with intensity and hammer a Nail into the Yantra. 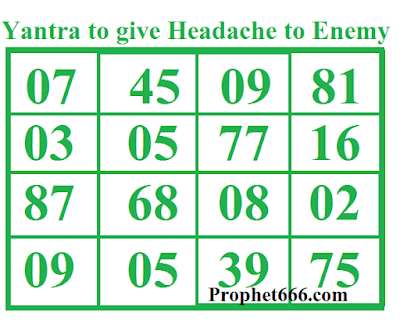 That is all that has to done as per the Tantra, which says that this will make the enemies head start aching severely and distract his mind and stop him or her from bothering the Spell Caster. Note- this is an out and out Tamas-Guni Yantra Experiment and should only be used for protective purposes to divert the attention and concentration of an enemy and stop him from troubling you. There is no infusing/energizing procedure for this Yantra. Neel ji, can I use iron rod instead of hammer, please reply me. Sure, any heavy object to hammer the nail will be sufficient. Please also advise the counter remedy for this ? In which place should we nail the leaf? Near our house, near our enemy's house, on the street or at a cemetery? It can be done in any place as mentioned in the post. Neel ji last question "hammer a Nail into the Yantra" means on soil floor only it has to be done or can do on any solid floor like marballed floor please reply sir, eagerly waiting to get rid of enemy problems and to give pain. It can be done on any kind of floor, but is much easier if done on on a soil floor. How can it be removed after it is practiced once on any enemy? Can it be reverted back at a later stage? Onces said process done what should we done with yantra and nail.it should be immense in flowing water. Do we need to write name of enemy on this Yantra or not ? If yes, where will we write enemy's name on this Yantra? On the back side of Yantra? Can we write this Yantra on white or yellow piece of paper? The leaf of the Kaner tree is a must, the spell will not work on paper. Sir, i m not a layman having very less knowledge of yantra &mantras. Can i try these simple experiments without any dheeksha or guru. If you are confident of yourself, then there is no need for a Guru if practicing basic and less complicated Yantras and Mantras.